In the winter of 2010, the first works in the ongoing "Material Language Series" (a collaboration with artist JD Beltran) debuted: portraits which combined painting, photography, Super-8 film, and high-definition video, all within a single composition. A single surface was divided vertically into four parts, and the far left fraction of the image was rendered n painting, the second part was printed in large-format photography, the third part was captured in Super-8 film, and the fourth portion was captured in video. The original compositions – either a portrait of a person in their workspace, or the landscape of a city – were recorded in all of these media at the same moment. Incorporating this still and time-based imagery in one panel involved embedding a thin-screen LCD panel within the frame, which was used to display the Super-8 film (transferred to HD video) and HD Video portions of the image. 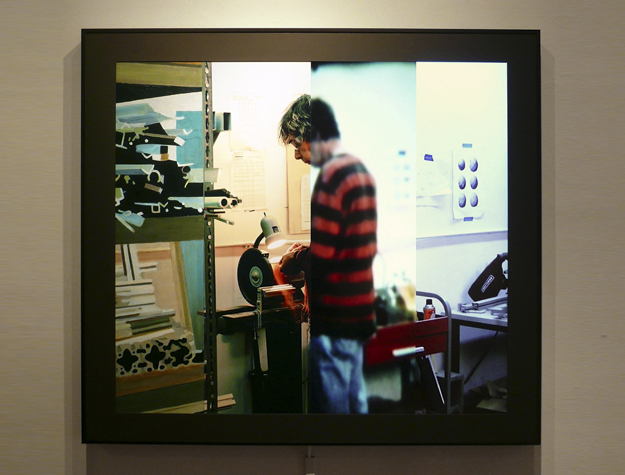 The painted portion of the image was completed using oil on wood veneer mounted on the Plexiglas surface, and the photographic portion was completed using a C-Print mounted on Plexiglas. (The remaining clear Plexiglas extended over the LCD screen, which displayed the film and video). One image was conveyed in four different, contiguous media having a seamless, single surface. Once these media conveying a single image are combined within the same composition, the differences, nuances in meaning, comparative strengths, and even failings of each material in its portrayal of its subject matter become clear. Future investigations of the "language" of materials in this series continues, by incorporating sound and interactivity into these compositions.